Artistic rendition of what the current version of the CD-21 zone would look like from the Sails at the bottom of Bernard Avenue. 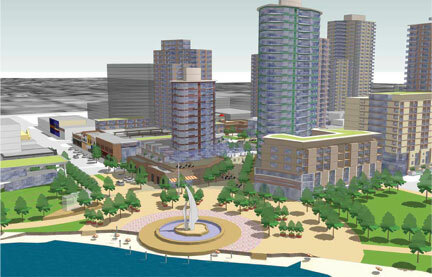 On the City of Kelowna website this view is described as Proposed Comprehensive Development Zone "Sweet Spot." On Monday Kelowna city council will begin unravelling a plan to redevelop downtown that a few weeks ago was only one stitch away from completion. And depending on how much it pulls the threads apart, council could find itself having to sew a new plan from scratch. After this workshop, city staff will take any amendments to the plan proposed by council and investigate their implications. Depending on how extensive the proposed changes are, city staff could have to drop other projects they are working on in order to turn their attention to the CD-21 zone and it could cost a lot of tax dollars if engineers and architects need to be brought in to make revisions. Substantial changes could also mean the plan will have to go to another public hearing and then be sent, once again, to the Ministry of Transportation for approval. Both those steps are cumbersome. The public hearing for the current plan, held in October 2008, heard from 67 speakers and lasted 9.5 hours while the ministry took about 14 months to approve the plan with minor modifications. Council is taking a big gamble here. Critics have loudly condemned the move to reopen the plan arguing modifications could still have been implemented through bylaw amendments after the current plan was adopted. Many see this step as a way to kill the plan by putting it into a never ending limbo. The councillors who voted to revisit the plan have said they mostly like the plan but are uncomfortable with certain aspects of it, notably its call to put a hotel on what is now park land. Personally, I share concerns about giving up park land and think it’s a good idea to take advantage of the lull in the economy when no one is going to be building anything anyway, and come up with a plan that properly protects the public interest. Once developers have gobbled up the land and put shovels in the ground, it will be too late. But the challenge now for council, and one I really hope they are up to, is for them to back up their words by focusing their attention on a few really important issues and not nit picking the plan to death. Need a primer on what exactly the CD-21 zone is? Thank you for another story that is well researched and articulated from many positions. Isn’t this what good journalism was once about?